Registration | Look at the tips and advices on the HowTravelCheap.com! Adam Ondra (CZE) was 2nd, Ramón Julian Puigblanque (ESP) won on lead climbing on European Championship in Chamonix (FRA). 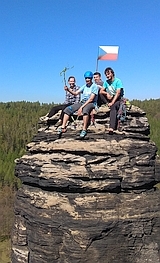 In speed Czech climber Libor Hroza won. czech climbing forums ankety links guides fotky video *rss* private policy ceník reklamy Energy Cloud NetPro systems, s.r.o.